The crown of a duke was placed upon the babes’ head, for mere months after his birth his father had passed from this world due to illness. Childhood is a rough experience in the north, more so as a child ruler. The young duke had to fight off the advances of many foes, including those within his own family to hold onto what he had, and to survive to claim his birthright, the High Kings crown. 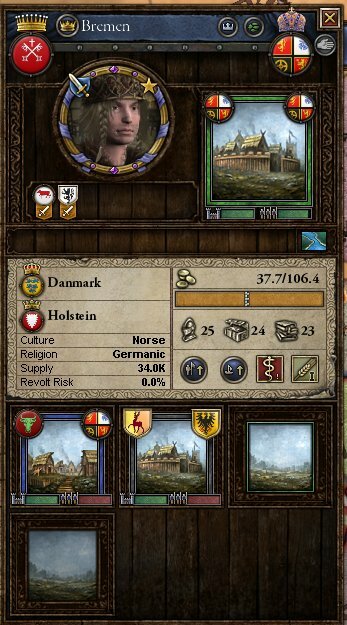 Finally, after 29 years as the ruler of the strategic islands between the Republic of Danmark, the man, now grown, sailed for Castle Lade. 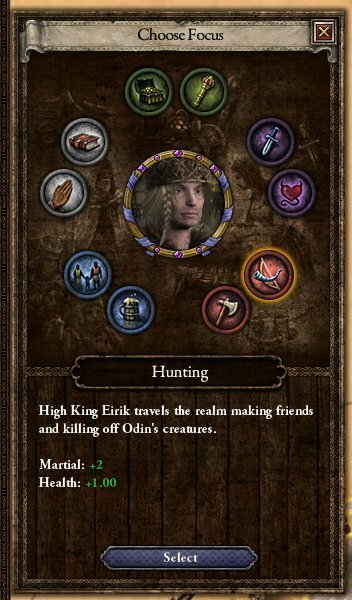 Thus begins the story of High King Eirik,the Young Duke. 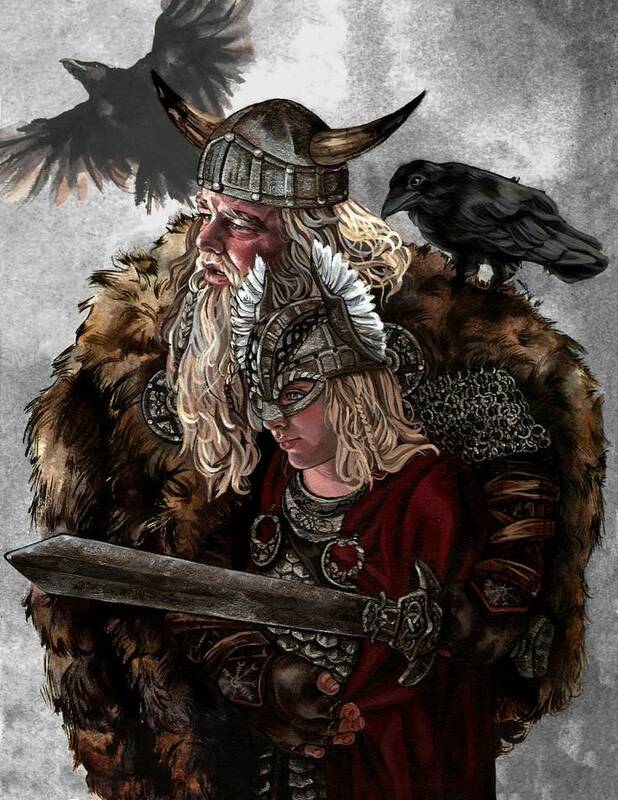 (Source: https://i.pinimg.com/736x/01/4b/a7/014ba7d0bea299718b42656167712842--odin-thor-les-vikings.jpg)The grandson of the former ruler now sat on the throne in Castle Lade. For the first time in the history of the nation had the crown skipped an entire generation, much to the anger of High King Eirik’s uncles. Not since the brothers Sigurdr and Fredrik, the second and third kings of Norway, had a crown not passed from father to son. 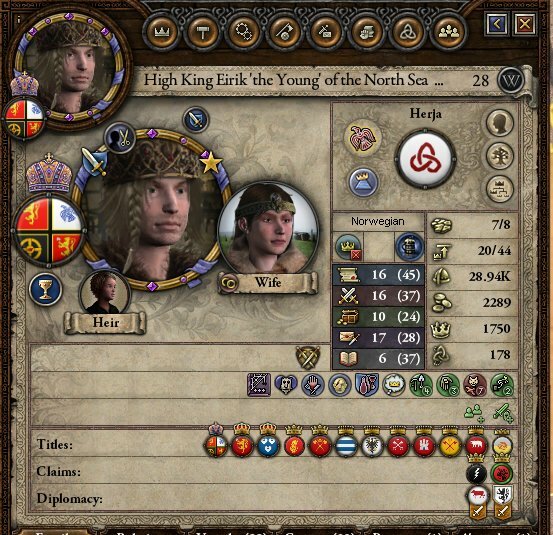 Already older than his father was at the time of his death, the newly crowned High King had ruled the Duchy of Sjaelland for almost his entire life. This had allowed the development of many skills that would be useful to the man as he travelled from his small island holding to the court in Castle Lade. Equally skilled with battle-axe, quill and dagger, there was not a lot that could not be performed by the new High King. With him though, he brought many vicious rumours of how he spent his casual time. Rumours of hedonistic pleasures and, more worryingly, a taste for the flesh of man. One of the first acts of the new monarch was to find out the strength of the realm that he now ruled. The North Sea Empire was the second largest realm known to man, dwarfed only by the lands of the Rus. Stretching from the frozen north of Norway to the Frisian coast in the south and the lands of Anglia and Skottland in the east, this multi-cultural nation was united by faith. To the east laid the lands of Odin. The biggest was the Kingdom of Rus, which stretched from the Baltic Sea to the Ural Mountains. However, there were many others that stood proud next to the two giants of the faith, Sweden had for a long time been an equal to the now subsumed Kingdom of Norway, and Lithuania stretched from the heartland of the faith to melting pot that was Black Sea. The Wolves of Midgard continued to guard the southern flank from the Catholics, although the revolts demanding a Polish King rule over these lands had put their ability to do this into doubt from other Norse monarchs. 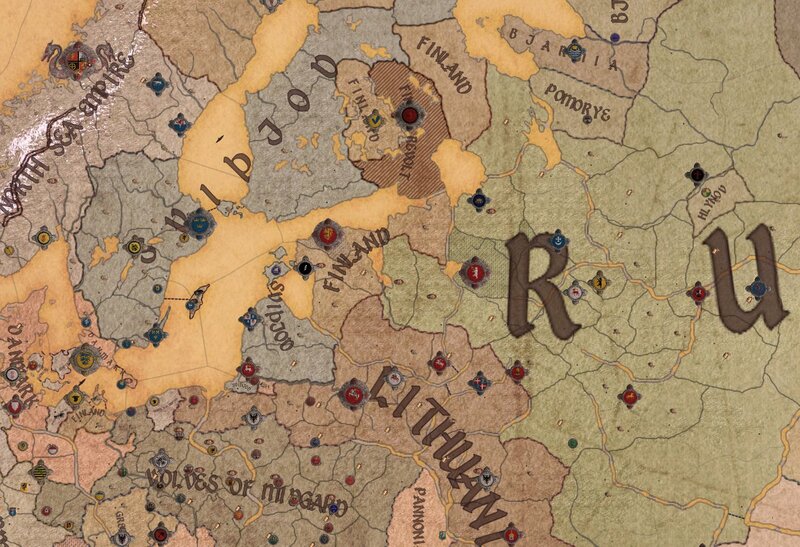 Finally, there was Finland, once part of the Kingdom of Sweden, since the splitting of these two crowns the Finns had seen both great success, in the integration of the Kingdom of Lappland, and great loss, as large rebellions had torn through the countryside over the years. In the south west, the Catholics continued to squabble amongst themselves, although a few kingdoms had formed. The might of the Catholics in the west was the Kingdom of Germany, on the direct southern border of the empire. 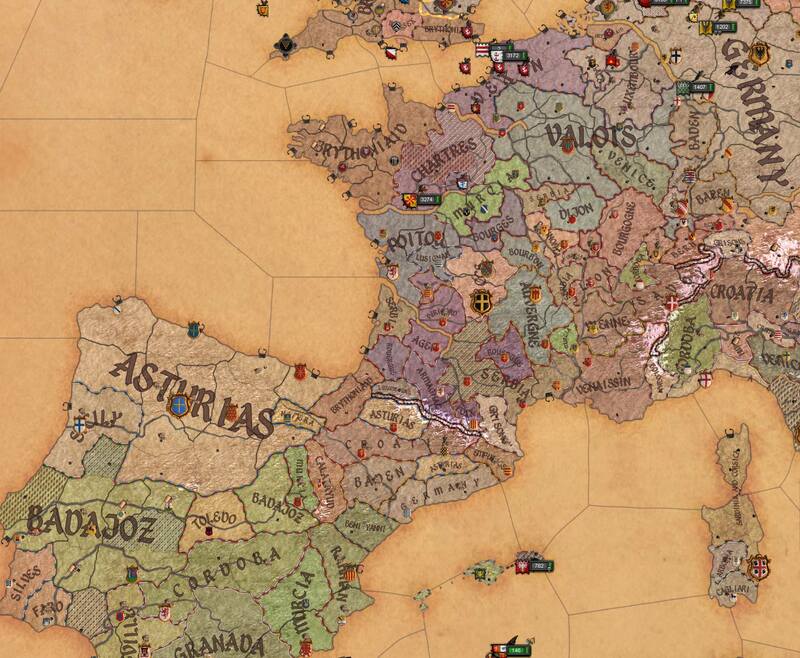 On the Iberian Peninsula, Asturias was the great power after the fall of the great Kingdom of Mauretania. Although the kingdom had been reborn, it had never regained the strength and prestige it once had as a bulwark against the Muslims. 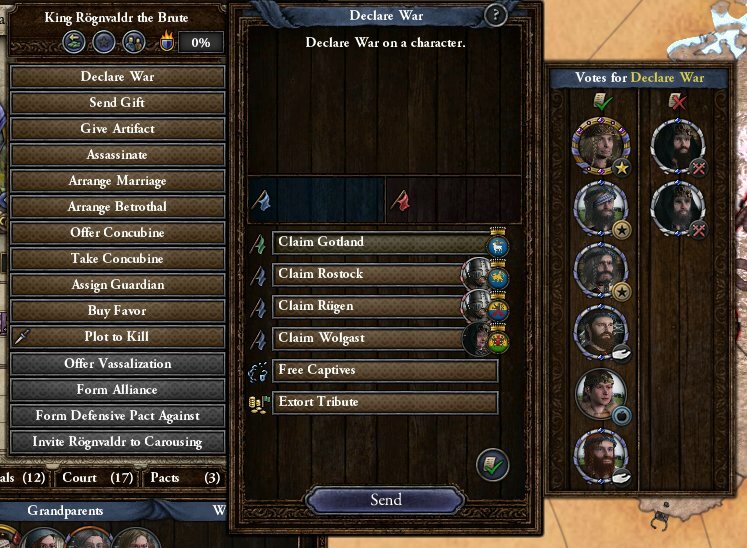 Early in the High King’s rule would see one of his most controversial decisions, to disallow his vassals from declaring their own wars. 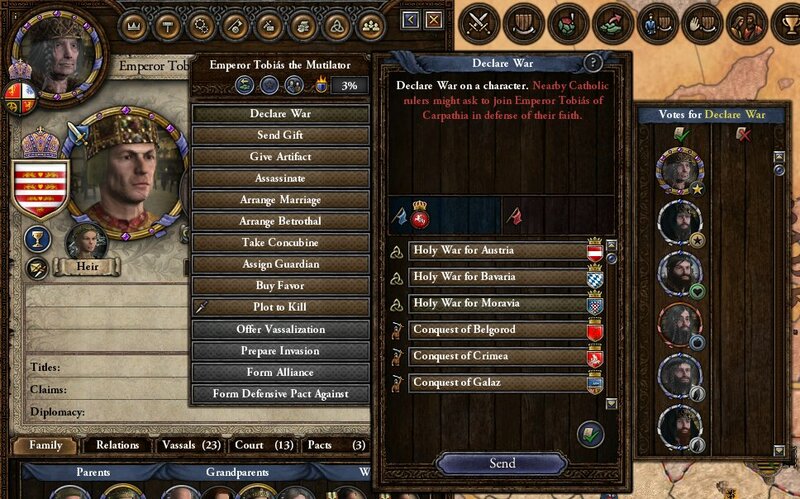 In the past, this has prevented the monarch from being able to call upon the full strength of his subjects when needed as these troops could be elsewhere or killed, especially for internal wars. In exchange, High King Eirik instigated a gathering for the nobles to partition the High King and his council to declare war on their behalf. Whilst the Dukes and Counts lost their ability to wage war where they wished, having the strength of the empire behind them when they needed was a trade that they could make, admittedly begrudgingly. The reason for this law was quickly discovered, as the High King ordered his armies marshalled to march south. The Germans had held a castle on the Elbe river that had constantly harassed local merchants and fishers, but that had held out whenever there were any local attempts to take the castle. Declaring that this thorn must be removed, war was declared against the Boy-King of Germany. 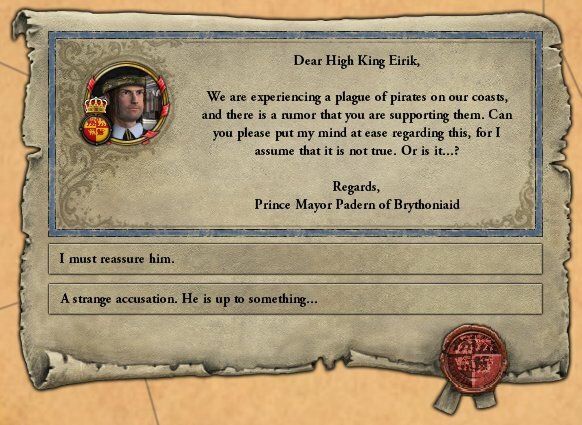 Hoping that such a small claim would prevent the other Catholics from joining, High King Eirik rode at the head of his army as they made their way to Stade. Unbeknownst to the High King though, the Germans happened to be marching through these lands when the declaration was received. Changing direction, these men quickly laid siege before the empires armies had even finished marshalling. This setback and lack of intelligence on their enemy meant that the initiative of the war had been lost. It would be an uphill battle to regain it. 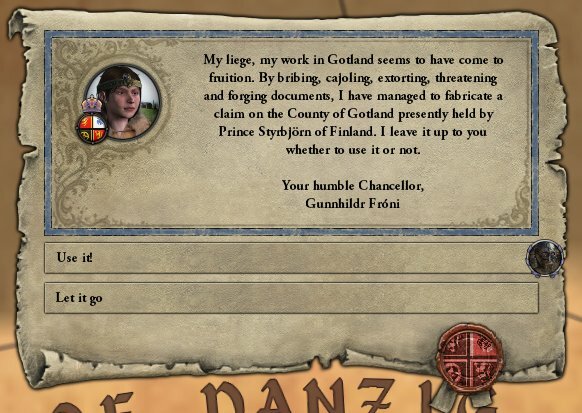 The war against the Germans was not the only plan that High King Eirik had in motion, and quickly his chancellor and wife reported that she had been able to ‘acquire’ documents that validated a claim against the island of Gotland. From his time as a duke on the island of Sjaelland, he knew that control of these strategic islands in the Baltic sea would determine control of both war and trade. However, these plans were quickly put on hold as the army marched over a crest and was greeted by an equally large German army reinforcing the garrison at Stade. With both armies marshalled into one grand host for each side, this battle would determine the rest of the war. Having marched south before heading north, the High King avoided having to battle as his troops crossed the Elbe river. Whilst the battle had been close on paper the Germans were able to gain an advantage when the centre collapsed against the frenzied Catholics. 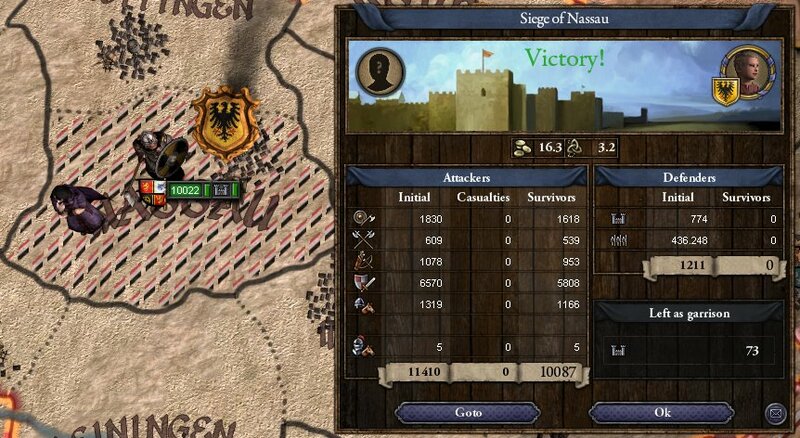 Luckily for the northmen, the flanks were able to rally and pincer the German army as it surged forward. Slaughtered and chased from the field, siege works were setup to once and for all breech the walls of Stade. From the south came news of death of the King of Sicily-Portugal, and the end of the union of Italian kingdoms. Having no heirs produced from his marriage with the Queen of Italy, the Catholics hope for another strong, united kingdom was dashed. Whilst this should have pleased the High King, news also travelled that the recently widowed Queen had already sought a new companion, the young King of Germany. How messengers were able to escape the siege of Nassau to arrange the future wedding was a surprise. With no reinforcements on the horizon and their supplies gone, the garrison finally threw open the doors to the invaders. Despite missing the king, who had escaped earlier, the northmen were able to capture his sister, the heir to the crown. Obviously having counted on her freedom for his plans, the young King was forced to the negotiating table and granted High King Eirik control of Stade. In the end it was a rather worthless strategic victory, but the fact that the Catholics were able to be defeated so quickly gave hope to many. 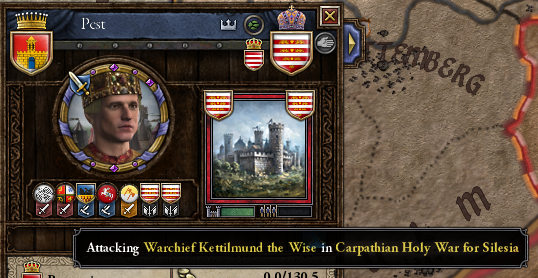 With the realms separated, it was inevitable that a local noble would crown himself as King of Bavaria. What remained to be seen is if Panonnia would strike at the two, now weakened, kingdoms. A pact of non-aggression had been signed with the Welsh whilst High King Eirik had been a Duke to secure safe passage of trade vessels that passed through. In exchange, the traders of Wales gave a good price to the local merchants. So when pirates began harassing the coasts of Norway there was some cause for concern. When the spymaster reported that there were rumours that these brigands were under the employ of the Welsh Grand Mayor, the High King was infuriated. Yet diplomacy prevailed and the long-time acquaintances were able to smooth out any hostilities. 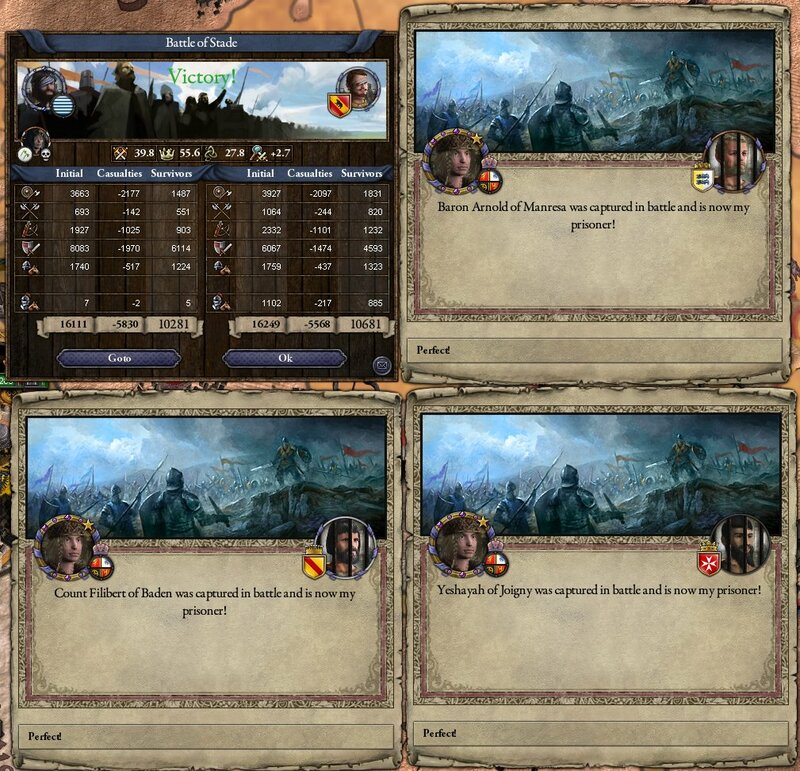 Perhaps the High King just didn’t want to risk a two front war, as armies which had only recently been in Germany were marshalled to march upon the Finnish. The majority of the men would land by boat at Gotland, whilst the remainder would move north and siege the under protected Lappland. Unprepared for war, the defence at Gotland quickly fell after several months of siege. From here the men that did not remain as a garrison were to set sail for the capital, via the southern lands of the Finnish crown. 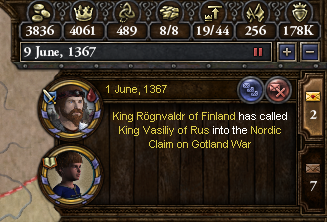 Unable to stand alone against the might of the North Sea Empire, the King of Finland reached out to his ally in Rus for assistance. Despite promising to march as soon as possible, the great Russian army was never seen. 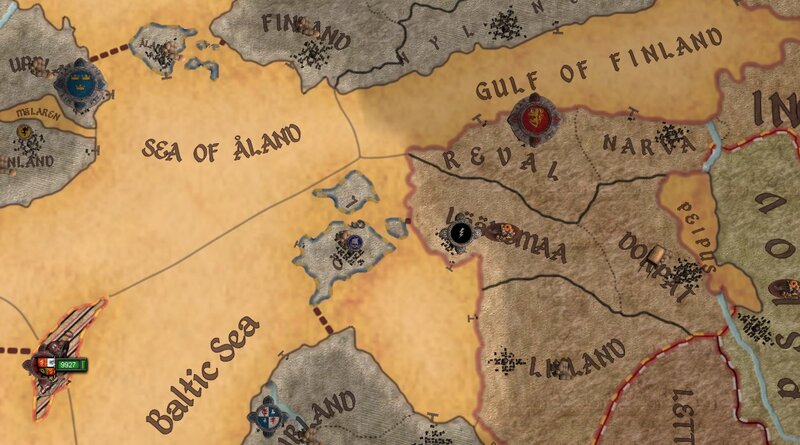 As the invaders made their way north to Reval, King Rognvaldr, King of Finland and kin to High King Eirik was forced to concede that the war was lost and control of Gotland was added to the Empire. With the war over, a new problem reared its head on the horizon. The Grand Prince sent word that pirated had attacked the Welsh lands. 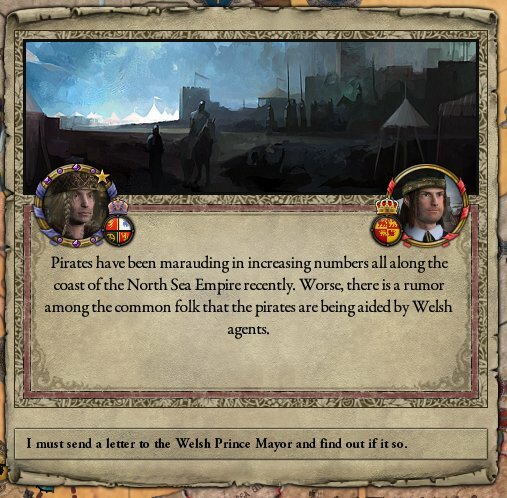 Concluding falsely that this must be revenge for the rumours of pirates assisted by Wales, the leader of the republic’s letter was filled with veiled accusations. 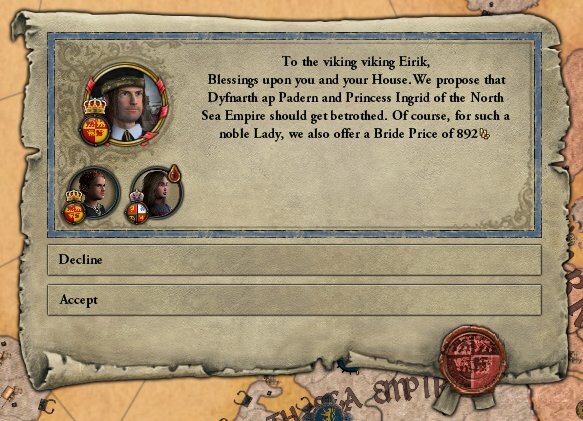 Angered at this allegation High King Eirik responded that if the Welsh did not believe in that he followed their non-aggression pact, then there was no use for it at all. Instead the response was far from expected. Rather than renege on their agreement, the Grand Prince sent over a treasure boat, laden with gifts. In exchange, the High King would consent to the marriage of one of his Aunts to a son of the Grand Prince. 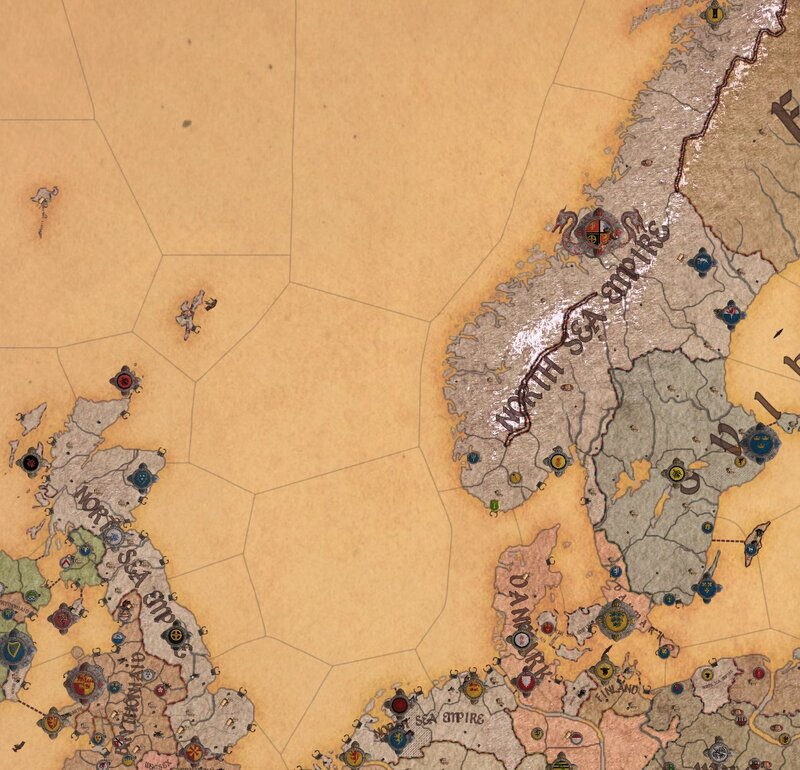 Overjoyed at chance to tighten the friendship between the two nations, rather than go to war, High King Eirik agreed. 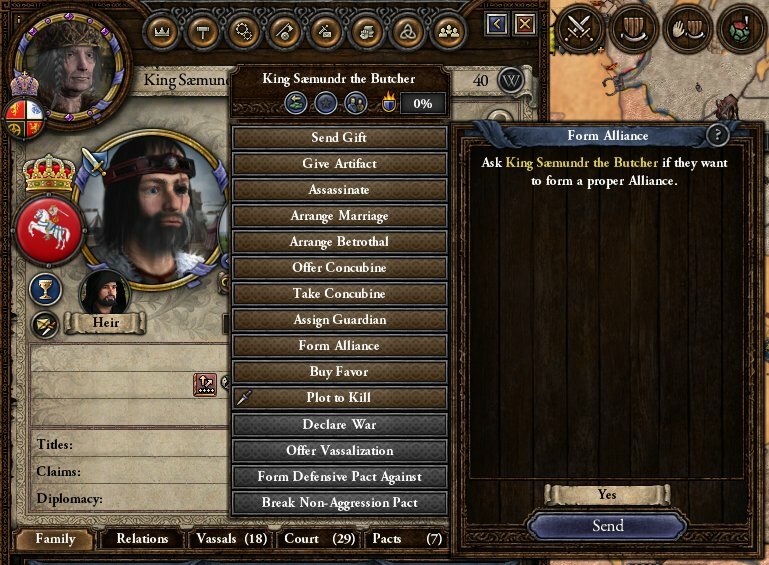 With the might of his armies proven now in two wars, the High King sought next to prove that his was worthy of the mantle of High King personally. Leading the Félagi Auðr south into the lands of the Pannonian’s, High King Eirik lead a bloody path along the coast that resulted in many boats full of loot and prisoners. Leading from the front he developed a reputation of bravery and martial skill, although rumours that the sight of a foe was enough to send him into a terrible rage and many whispered that their leader had been touched by the gods themselves. The years passed and finally Ragnvald, the son and heir of High King Eirik was old enough to be introduced to the realm. 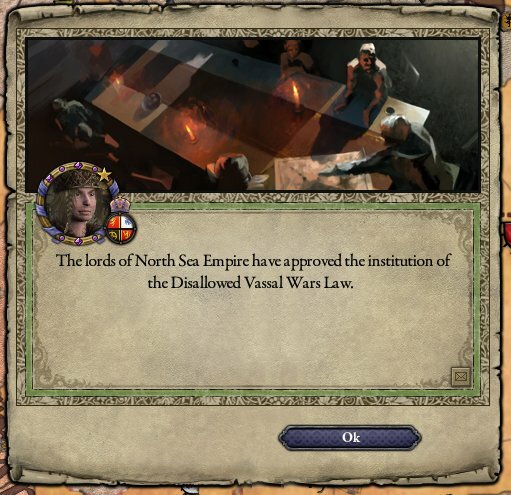 Impressing all before him, the future looked bright for House Herja and the North Sea Empire. When not leading the raids with the Félagi Auðr, Eirik would spend his time in the forests that surrounded the capital. Stalking the woods, the High King would match himself against whatever nature could provide. The kitchens of Castle Lade would be the final destination for all manner of creatures that were found to be the prey of the monarch. Despite the many years of peace and prosperity, no realm can escape the ravages of civil unrest for long. What remains to be seen during these times of strife as to how much support can be raised. 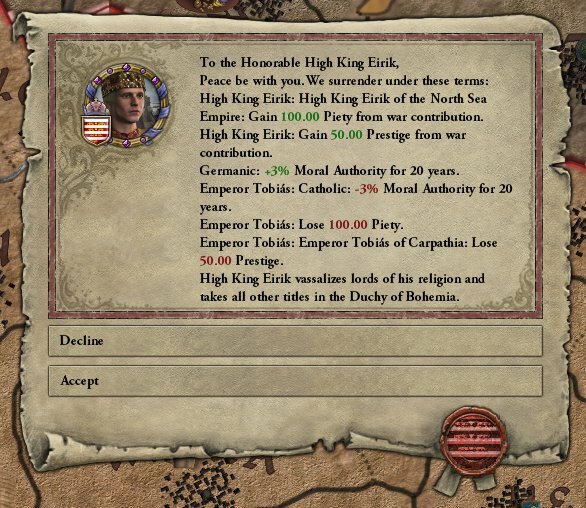 Thanks to the beneficial rule of the High King, not many were willing to march against the monarch. Without common support, the rebellion was swiftly crushed and the instigators executed. It seems rebellion was not just festering within the common class. A minor noble was found to have been following the fallen god Hel. Brought before the High King, his execution was ordered and was carried out by purifying fire. As the last of his line, his titles were confiscated by the High King and distributed to more loyal men. In a masterstroke of diplomacy, the Republic of Danmark and the North Sea Empire were able to agree on land concessions that would prevent future wars. 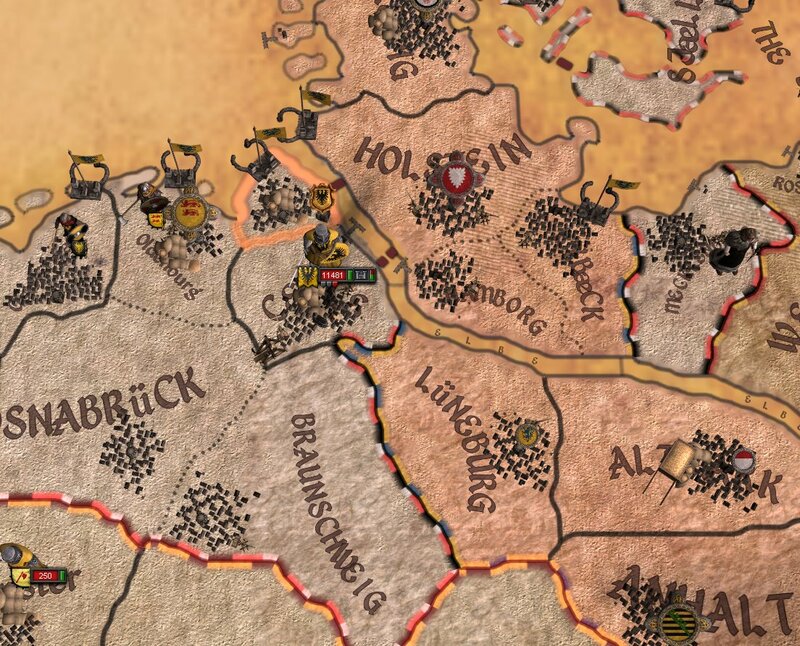 In exchange for lands in the south, including the title of Duke of Saxony, the High King granted control of the republic Mecklenburg but more importantly, the Duchy of Sjaelland. Just as this diplomatic victory was achieved, terrible news was received from the south. In a death stroke years in the making, the Pannonian’s moved into the Bohemian lands and removed the Norse presence there. Now the realm of Great Moravia did not control any lands of that name. 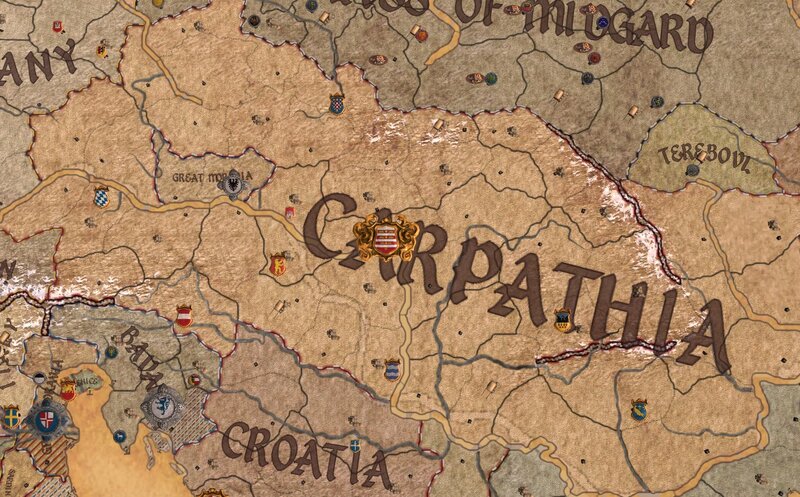 The Pannonian’s had founded the new Empire of Carpathia, in honour of the great mountains that protected their lands from their foes to the north. This was the final straw; the High King would need to intervene directly against the newly minted empire. The Lithuanians reported that the Catholics were moving into the Crimea, a valuable farming land that supported the rest of the kingdom. Declaring that the Carpathian menace needed to be halted, High King Eirik ordered the levies from across the nation raised and to march south. The Lord Mayor of Stolp, a close ally of the High King, reported that the commanders of the army were not to the standard that should be expected. Whilst the army was mustering, a few men were instructed on the latest techniques in leading the heavily armoured troops that made up the bulk of the High Kings forces. Yet even as the Northmen marched into Bohemia, news reached that the Lithuanian King had been captured and forced to surrender. The sudden end to what was supposed to be a major campaign was a great shock to all involved in the campaign. The armies that had spread over the Duchy of Bohemia were suddenly without a cause for their continued occupation. Quickly the nobles of the council were summoned to determine the next move. After some debating it was determined that a strike against the Catholics was needed, and that Great Moravia needed to be re-established to act as a buffer between the Carpathians and the North Sea Empire. 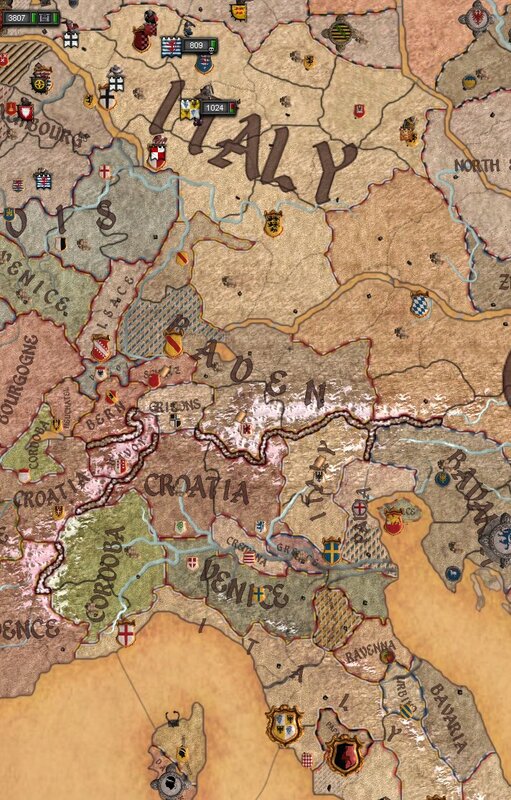 An offensive to take Duchy of Bohemia would be the first step, and after a unanimous vote, the war continued. 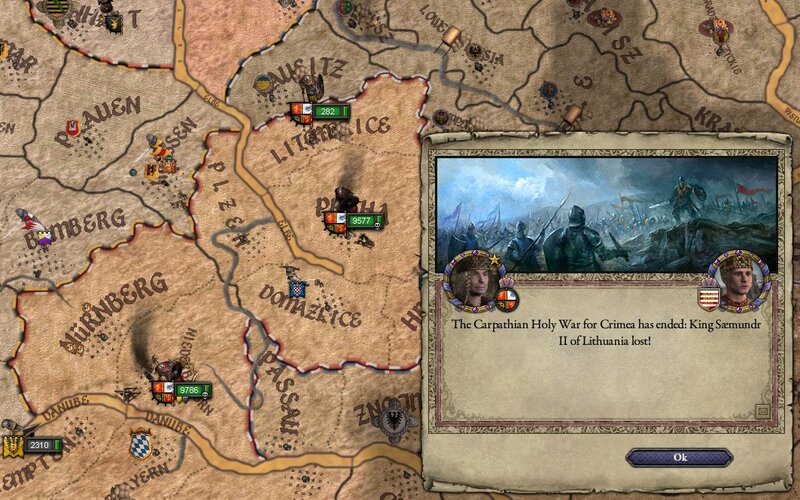 In the time that it had taken for the war against the Carpathians to be reignited, the Catholics had moved their armies’ north into the lands of the Wolves. 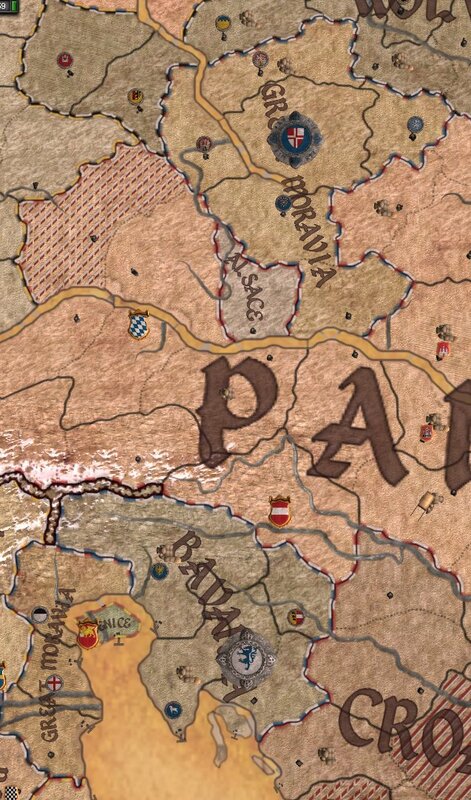 Distracted and assuming that the Northmen had marched back home, the Carpathians had decided to push further into the polish lands to weaken their greatest rival. 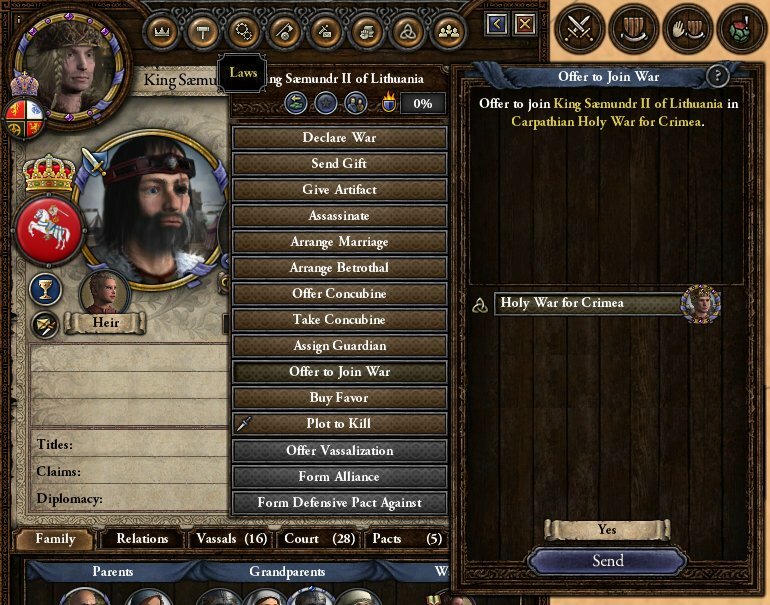 Now being at war with two of the greatest Norse powers, the only hope for the new empire was for aid from other Catholic kingdoms. 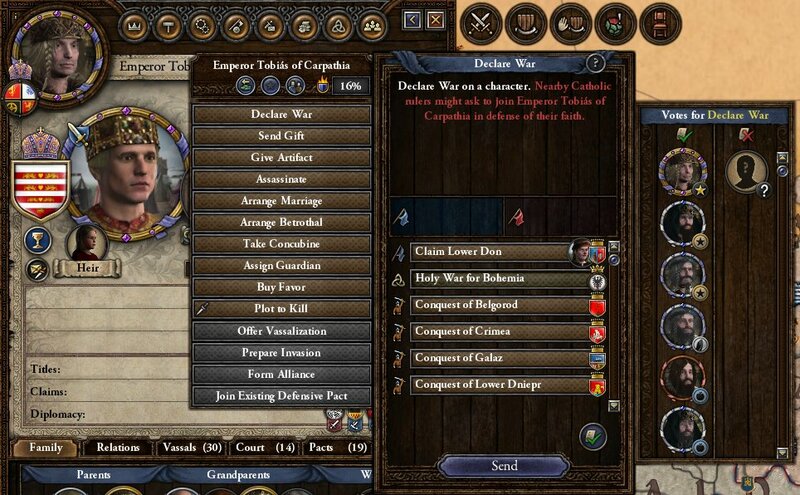 In the end though, the great Catholic emperor could not hold against the dual forces from the north. Brought to the negotiating table, the Norse lands of Bohemia were brought back under the control of a Norse ruler. This was a great dishonour for the Bohemian people of Carpathia, who had just managed to recapture their ancestral homelands. 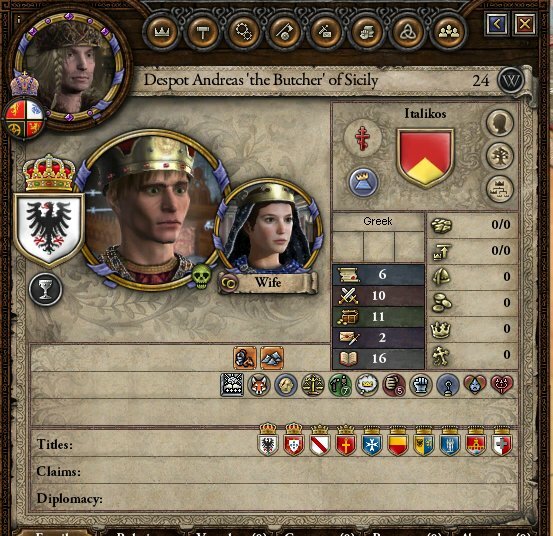 The expected merger of the two Catholic kingdoms of Germany and Italy finally took place when the King of Germany died. His throne passed to his daughter, who already ruled in the south as Queen of Italy. Already a formidable foe, the threat faced now by these two kingdoms on the axis of the mainland posed as great of a threat as the Carpathians, if they can stay united. 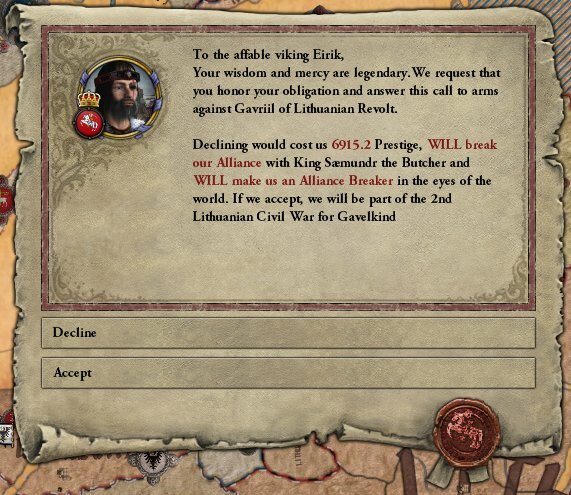 Fearing an incursion, High King Eirik sought an alliance with the Lithuanians. 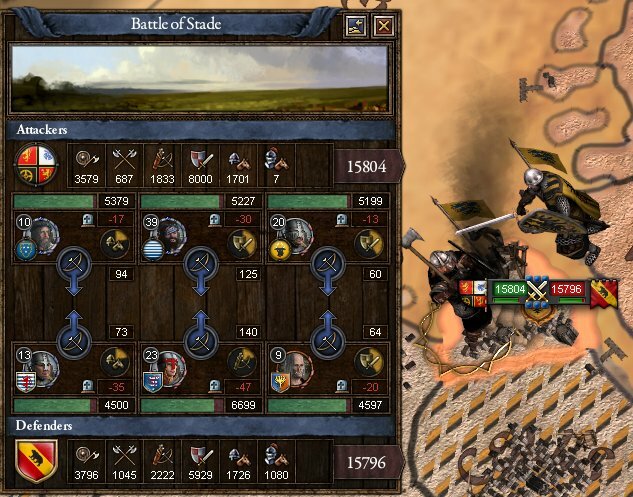 As two of the realms that bordered the Catholics, an alliance meant that any invasion would face both armies. It was hoped that this would be enough to dissuade any march north by the Catholics, and possibly lead to a Nordic-Lithuanian war in the south. 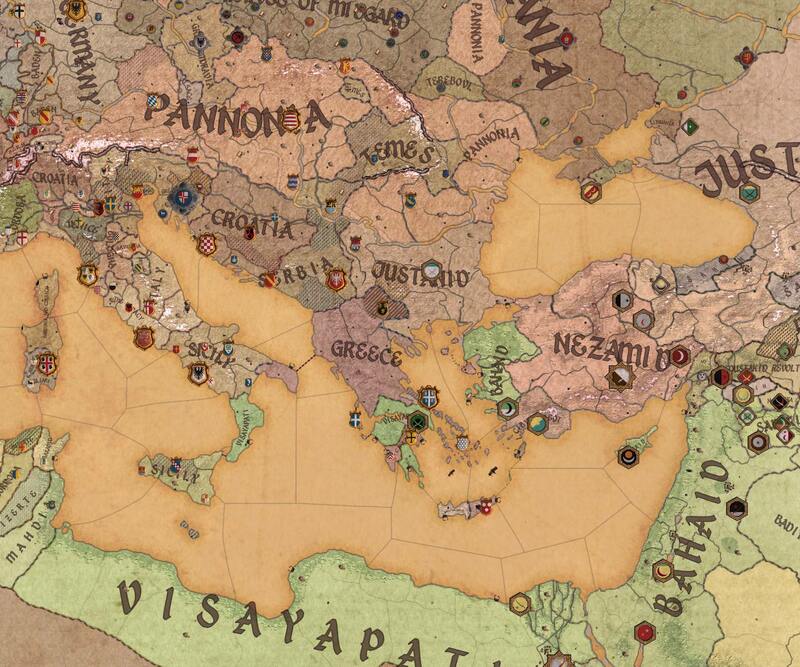 The Greek homelands had once been a stronghold of the Christian faith, both its orthodox and catholic types. 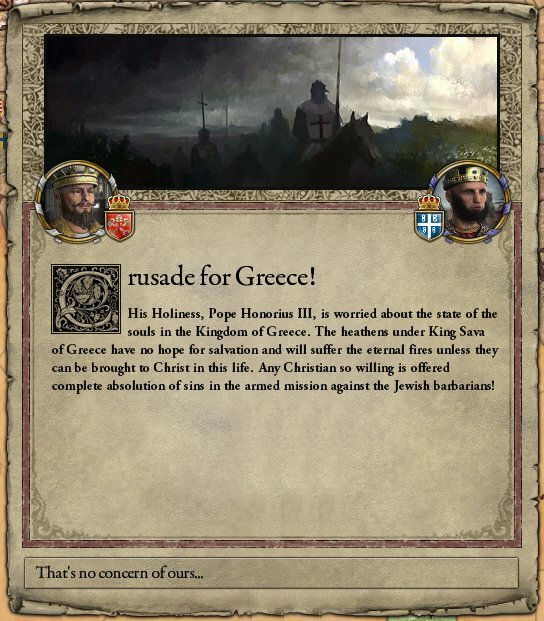 With the fall of these lands to the Muslims from the east, the holdout Catholic Kingdom of Greece has been a lynchpin in preventing further attacks west and supplying Catholic forces moving east. 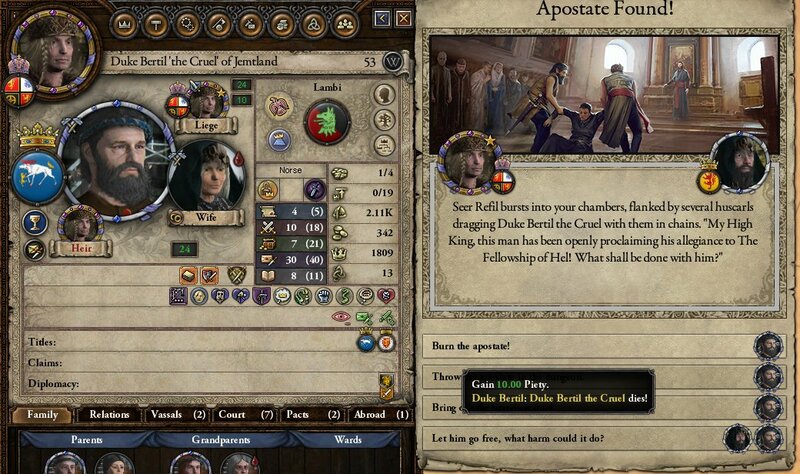 When its ruler converted to the Muslim faith, this loss was too much for the Pope, who called for an immediate Crusade to remove the heathen King from power and place the heir on the throne. 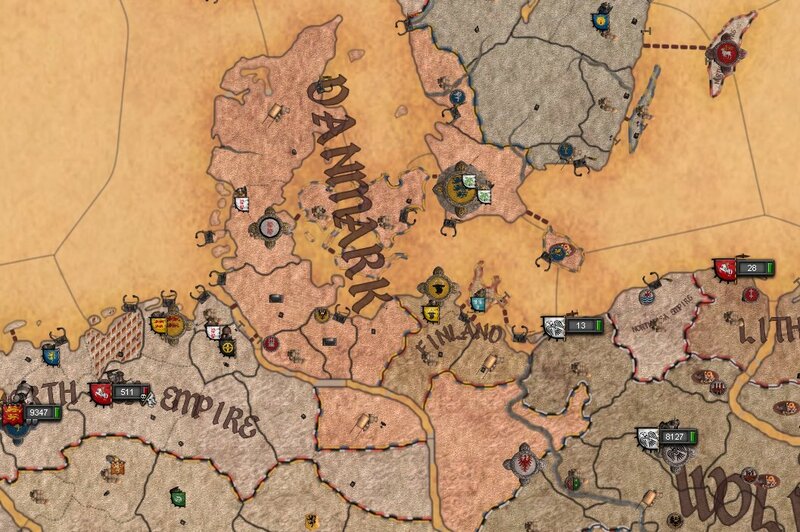 A few years after it had been signed, the first act of the newly forged alliance was to draw the North Sea Empire into an internal Lithuanian dispute. 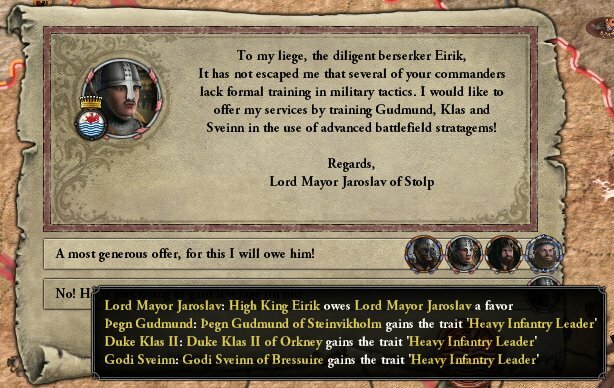 Frustrated at this development, High King Eirik honoured his commitment to King Saemundr of Lithuania and the armies marched into their allies’ lands to assist with defeating the rebels. Although outnumbering the troops by a significant margin, the conflict allowed for Nordic and Lithuanian troops to familiarise themselves with waging war together. That did not stop the Lithuanians to lose their capital before both armies were in a position to attack together. With the Lithuanians now in a position to attack, the High King announced that a great war would be declared against the Carpathians. 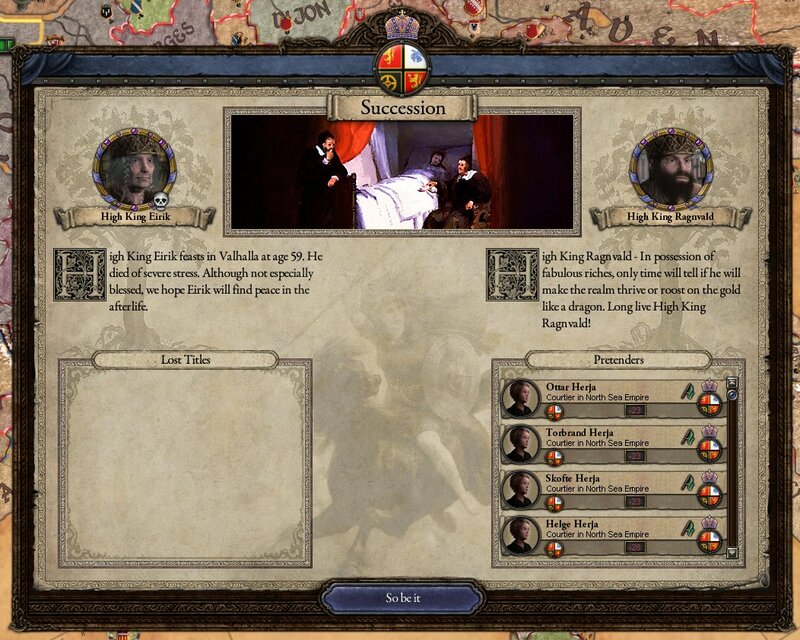 With the full support of his council behind him, High King Eirik declared that he would seek the return of the lands of Great Moravia, a crown that he had reforged after the acquisition of the Bohemian heartlands. It would be a war that he would never see though. Whilst on the march south, the High King, having seen almost sixty years, fell from his horse whilst on the march south. His closest attendants that their monarch had grown rigid and was clawing at his chest in the moments before he fell. Considered by many to be an ill omen, the leadership of the army and nation was thrust upon his son and heir, who was also marching in the host.